Let’s start with a quick look at the top 5 best oven mitts. 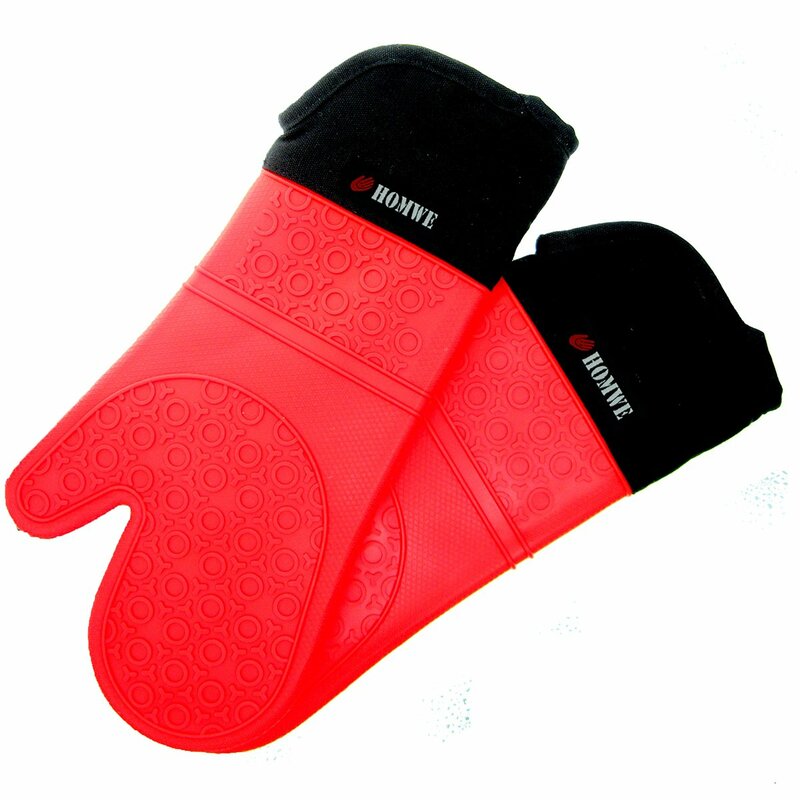 *Below, you can read more our detailed reviews for each above Oven Mitts. Obviously, you would use oven mitts to protect your hands from the heat as you handle food and equipment in and out of an oven. These gloves can often also be used with cast iron pans and pots and other culinary applications where high temperatures are involved. The concept of wearing gloves or mittens to protect the hands against heat, whether for cooking or for work that involved high temperatures, goes back centuries. It is not precisely known, though, when an insulated glove was first used in cooking. However, like many a kitchen tool, the oven mitt was a product of necessity. Since then, the oven mitt has kept many hands, and fingers, safe. Are Oven Mitts Essential ? Yes, they are ! It doesn’t matter if it’s a private or commercial kitchen. 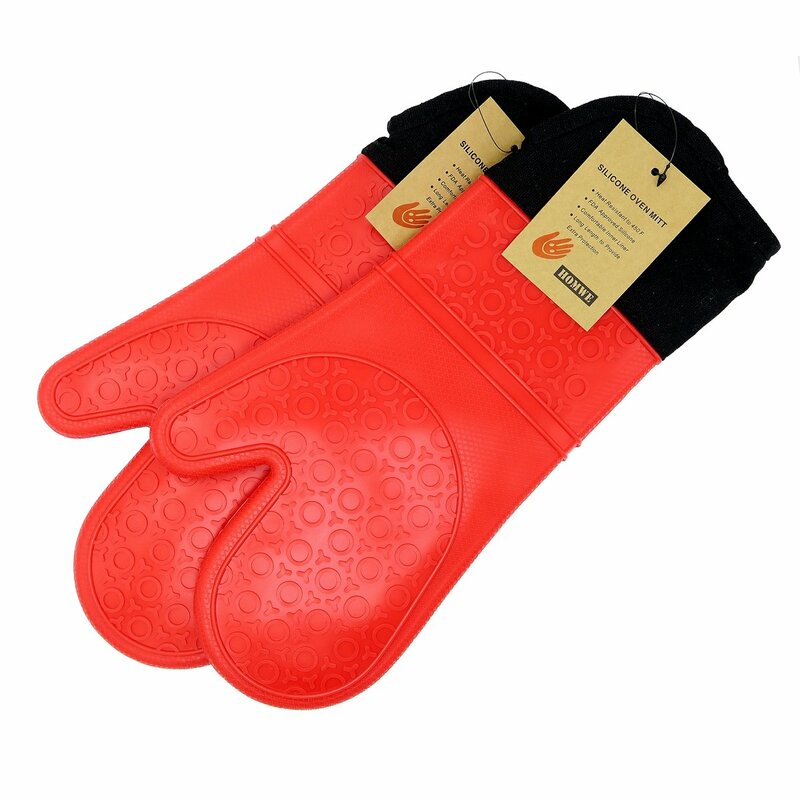 Because they keep your hands safe as well as promote safety in the kitchen, oven mitts are a necessity ! ​This is rightly so whether you’re an occasional amateur cook, a master baker, a mother of five, or a 3-michelin star chef. Cooking can be completely fulfilling but to maintain that joy would require some degree of safety, and responsibility. The happiness of fast cooking turns into anger and frustration when pain, especially in the form of burns and singes, comes in. 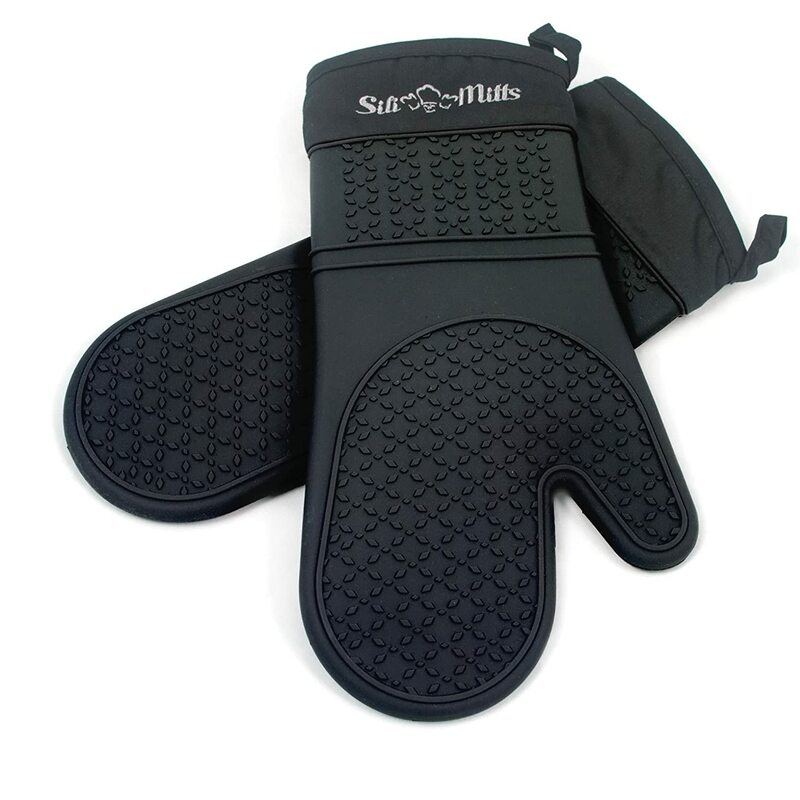 So, to keep things fun and happy in your kitchen, you’ll need the best oven mitts to protect you from those nasty burns and annoying splatters ! There are, however, so many choices out there that looking for a good pair of oven mitts can be as frustrating as accidentally touching a hot grill, most especially when you end up purchasing an inferior product. Not to worry, though, in addition to our top five oven mitts, we’ve also included in the next section the important things you’ll need to check and consider before getting your next oven mitts. The material making up the oven mitt is the most crucial element as you make your decision. Remember that the oven mitt’s material will determine its heat resistance, durability, weight, and how easy it is to keep clean. All oven mitts have some form of thermal insulation and vary in thickness. Products are either made of machine-washable textiles or more durable synthetic materials. Some oven mitts are even made of Kevlar, the very material that makes up bullet-proof vests. However, the most conventional oven mitt materials are cotton fabrics and silicone. Oven mitts made up of cotton fabrics, on average, can protect you against temperatures up to 200°F (or 93°C). On the other hand, silicone oven mitts are strong enough to protect your hands from temperatures up to 500°F (or 200°F). Silicon gloves will typically last much longer than cotton fabrics especially since cotton oven mitts tend to thin out when regularly exposed to high heat or regular machine-washing. Cotton oven mitts, however, will be much lighter than their silicone counterparts. Ultimately, though, the weight between silicone and oven mitts are often negligible, especially with the many advantages that silicone provides. As your preparing, cooking, and baking, it’s only a matter of time until those oven mitts will stain and become dirty. Sauces, dips, oil splatters and other residue means your oven gloves will eventually need washing. Silicone gloves clearly have the advantage here as they are much easier to rinse and wipe clean while cotton fabrics will absorb fluids and colors and even odors. Additionally, despite being machine washable, regularly washing cotton oven mitts will hasten their wear and tear. The best oven mitts will not limit their use to just ovens. Rather, they’ll continue to be useful when handling hot cast-iron pans and pots, holding roasted meat, and also cooking and handling meat on a grill or over an open fire. 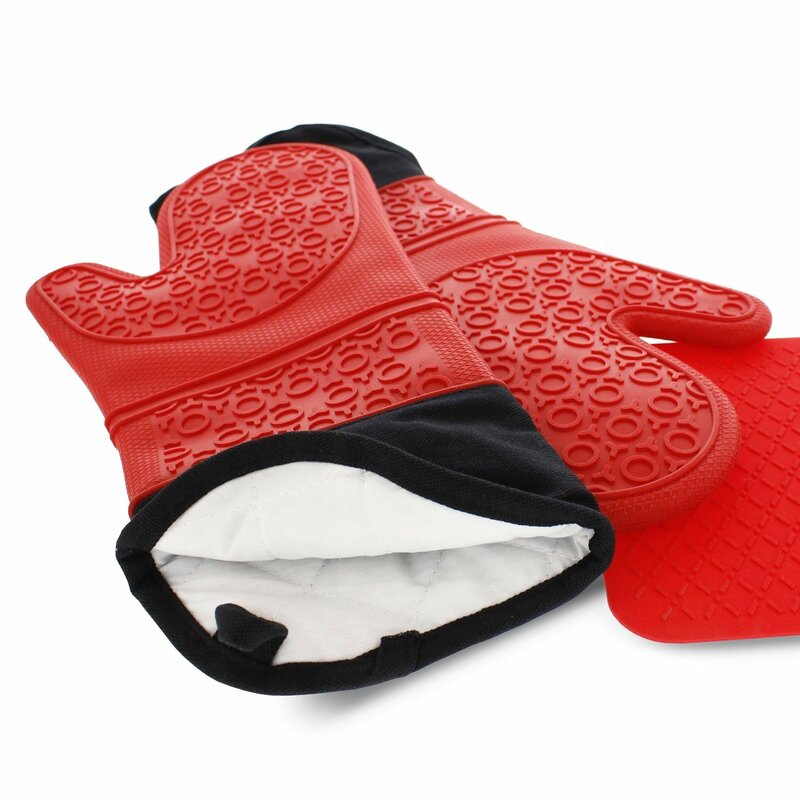 These multi-tasking features can only refer to silicone oven mitts since cotton fabrics are only ideal for handling cooking equipment over relatively lower temperatures. The overall design of the oven mitt includes its exterior and interior features, as well as its size and shape. The majority of these features accentuate both the mitt’s form and its functionality. On the exterior of oven mitts, typical of the best ones, are specialized raised treads or dots that helps with grip and control. These features are most commonly on silicone oven mitts that are dotted all over with these treads. A sure-grip is most noteworthy on particularly slippery surfaces such as glass, non-stick equipment, and ceramics, especially when food or cooking oils unintentionally lubricate these surfaces. Oven mitts come either in one-size-fits-all or the typical small-medium-large. It would be best, for both safety and comfort, that you choose the oven mitt that will fit you as snugly as possible. Hence, take into account the size and measurements of the product before purchase. Although the names “oven mitts” and “oven gloves” are used interchangeably, in their shape is usually where you’ll see their main difference. Oven gloves often cover your hand and your individual fingers, which allows for more control and dexterity. Meanwhile, oven mitts cover the entire hand except for your thumb, which provides more heat protection, but less fine control. In addition to an oven mitt’s size and shape, its interior features (such as lining or padding) determines how comfortable it will be on your hand. Now, with above information, let’s look into 5 best rated oven mitts for the discerning cook ! 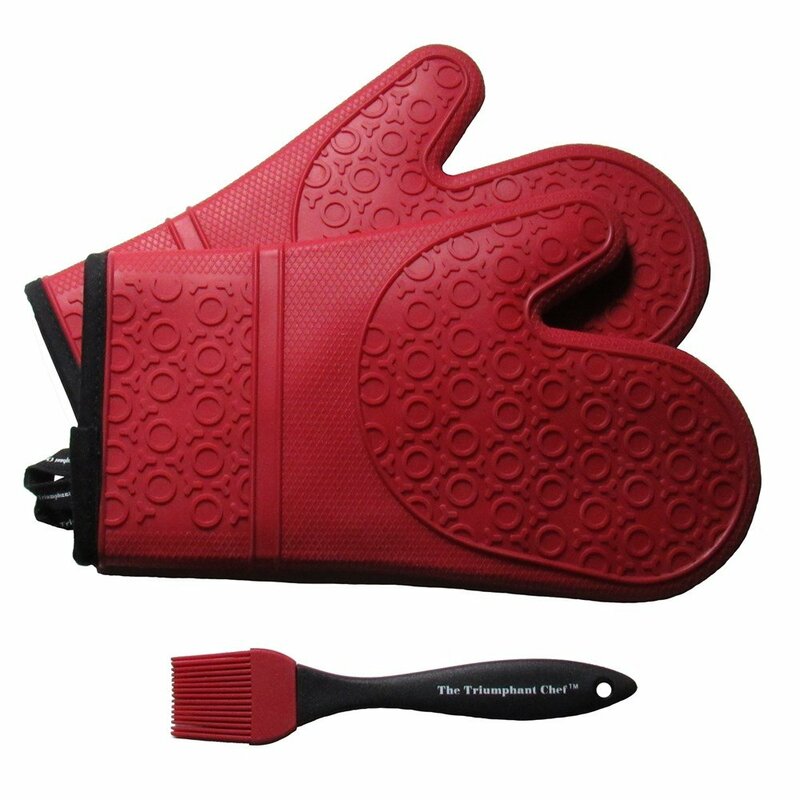 Our favorite is the number (#2) Silicone Oven Mitts, 1 Pair (2 x Dark Red Mitt), Deluxe Quilted Liner, Bonus Brush. These awesome oven mitts were such a joy to use that we were moved to cook and bake more so that we had enough reason to use them ! They’re incredibly light and very comfortable to wear while still keeping a good grip on most surfaces. Most of all, though, we hardly felt any heat through the gloves ! Although residue may at a time get stuck on the treads, the gloves are quite easy to clean. 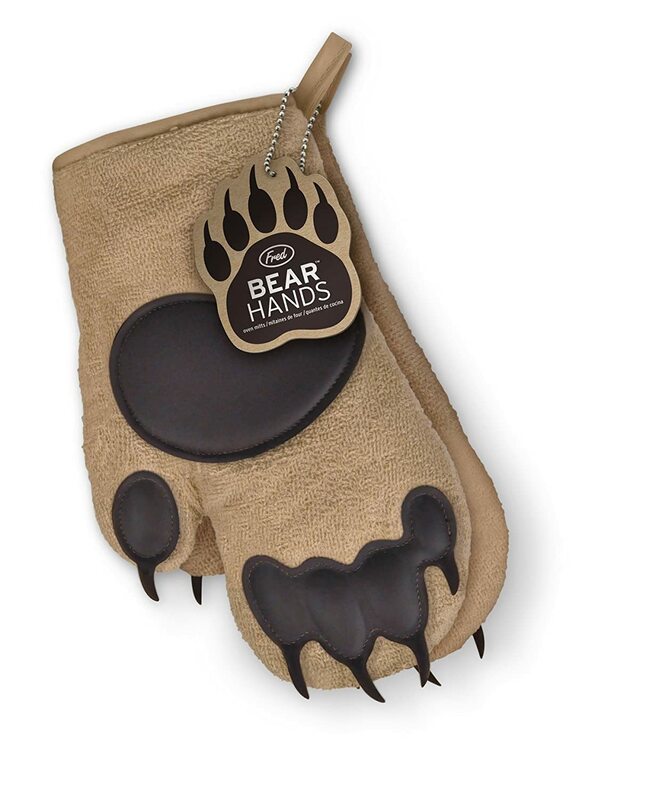 However, the fun and functional Fred Bear Hands Oven Mitts, Set of 2 were a great catch too ! 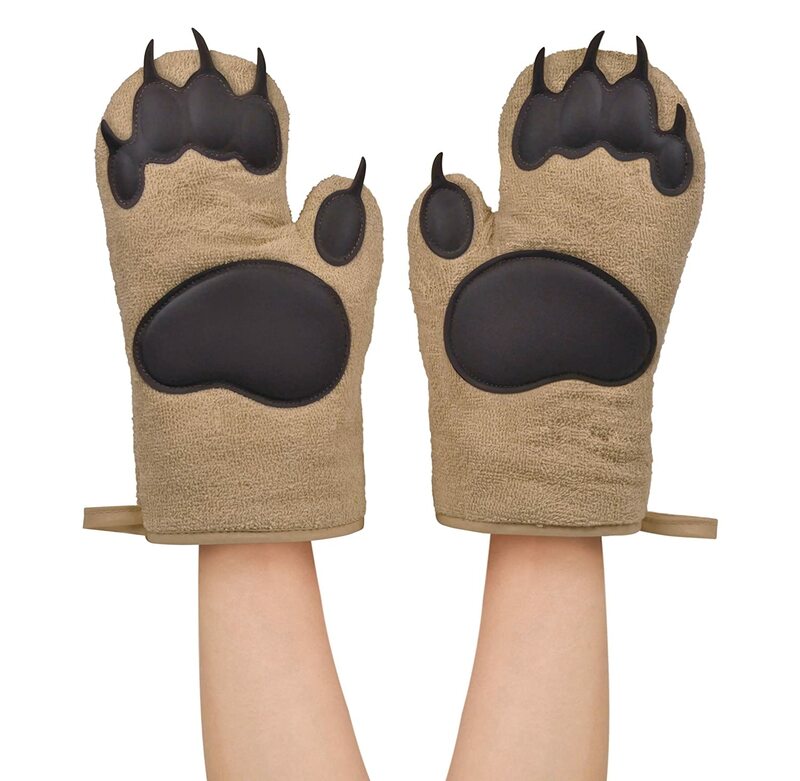 Despite its limited versatility, the bear paw gloves are ideal for families or those who love cooking with kids ! What do you think ? Did we miss a couple of great oven mitts ? Let us know !